Readers know that I’m always seeking out new ways to create natural cosmetics and homemade beauty products. I love concocting secret elixirs, magic creams and pastes from household ingredients found in my refrigerator and kitchen pantry. So it should come as no surprise that on Saturday June 9th 2018, when given the opportunity to test out a new secret beauty weapon, I couldn’t resist. Here’s Sam Dhutia, the founder and CEO of CanEggs Ltd egg white powder, cutting an avocado which could have been riper to be honest. That particular Saturday, I was booked in the morning and battled traffic to get the downtown location in time to attend this very special product creation workshop. 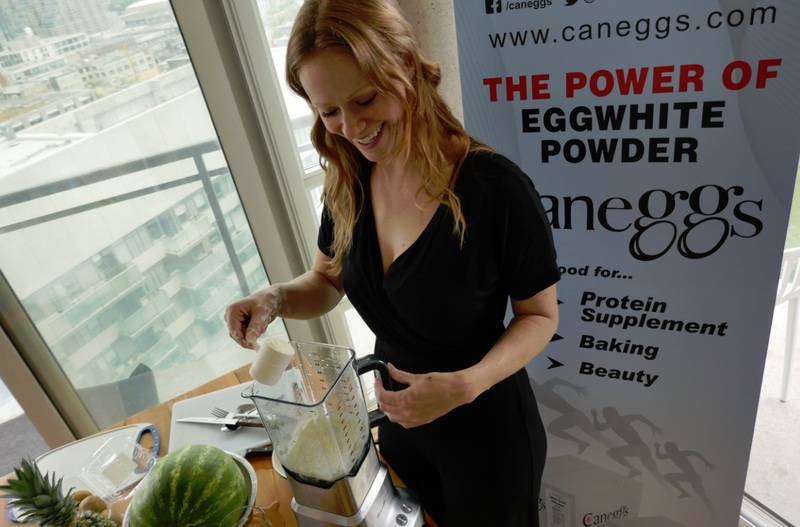 The event was ostensibly a free experimentation studio that centered on CanEggs brand Egg White Powder product, and it was made even more special by the highly creative people in the room. 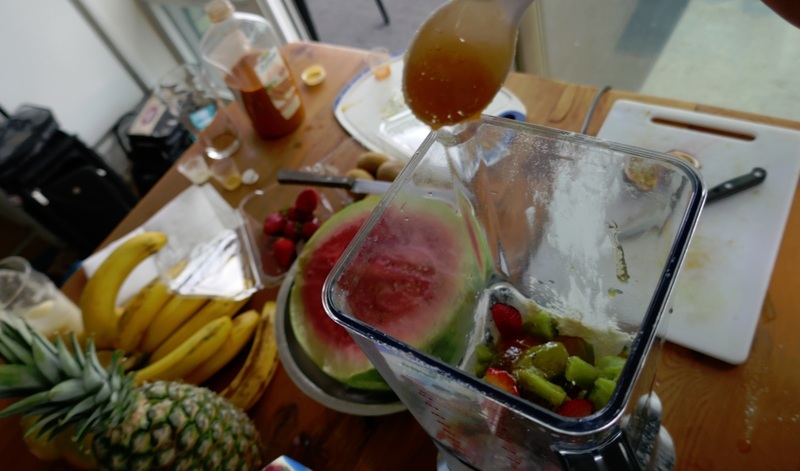 Christian Paruag from Fem Evolve health & wellness magazine spent hours, literally chopping fruit for smoothies. 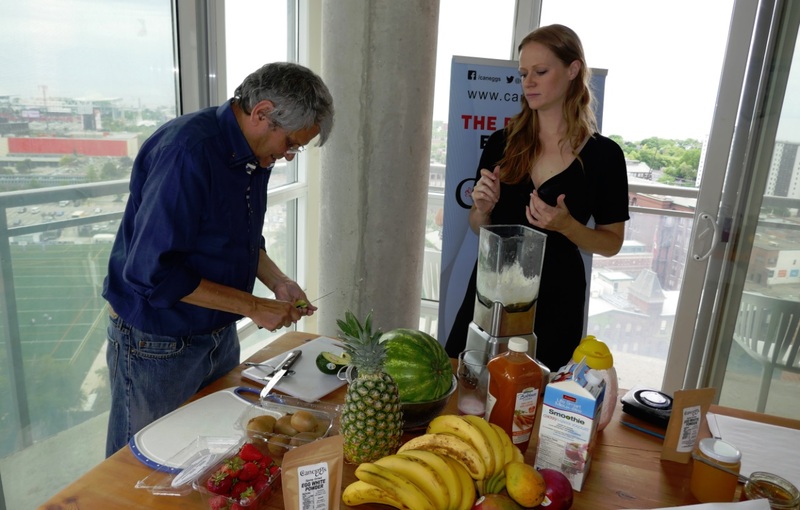 She’s a food scientist and cancer researcher and also a writer and magazine publisher. The luxury condo was also very cool and just happened to have an amazing view of the Toronto Wolfpack rugby game happening twenty floors down and across the street in Lamport Stadium. Premier Matrix Realty donated an empty luxury condo and wrote about the day on their blog, highlighting the Walk Score of the surrounding neighbourhood which is vastly improved by the International Rugby League agreeing to allow Toronto and Lamport Stadium to field a team. 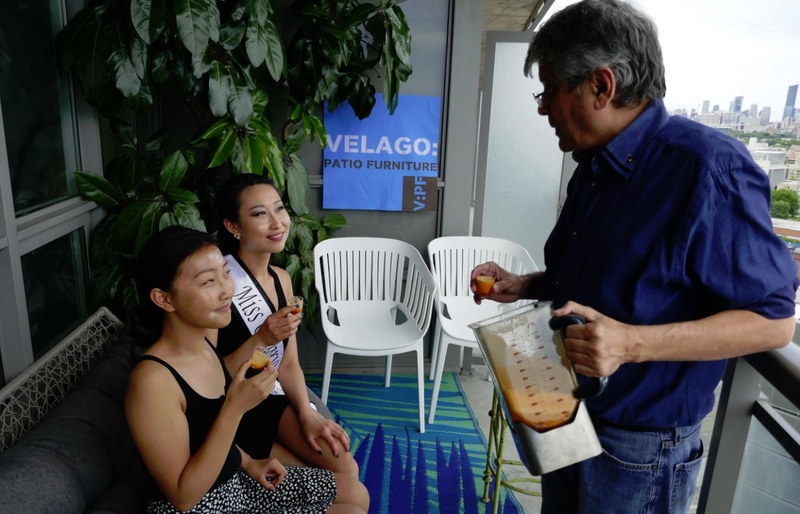 Another nearby business was Velago Patio Furniture which decorated the empty balcony. What exactly is Egg White Powder? Egg powder is made by machine-drying eggs with and without the center yellow egg-yolks. The dehydration processing method, usually done to preserve the foodstuff, is not new. The ‘powdered eggs’ product category came into existence around the start of World War II when the nutritional quality and ease of storage were practical advantages in supplying troops overseas. Dehydration is a successful method of preserving eggs, and results in an extended shelf life of six to eight months. In the 1960s, 70s and 80s, powdered eggs were usually selected over natural liquid egg products for ease and efficiency in large scale bakeries. Egg powders reduce transport costs, storage costs, and are easier to handle in a safe manner. Dehydrated materials are not as susceptible to harmful bacteria. 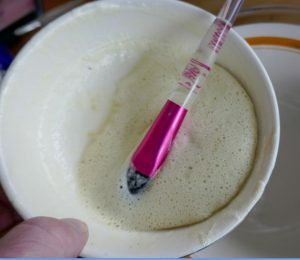 Also, and this is important, powdered eggs are more easily measured than liquid eggs. Egg powders are thus used in many segments of the food industry for institutional baking formulations. I spent the afternoon making myself an expert on egg white powder beauty masks using CanEggs powdered egg whites. Why use powdered egg whites when you can use fresh eggs? Answer: bacteria. 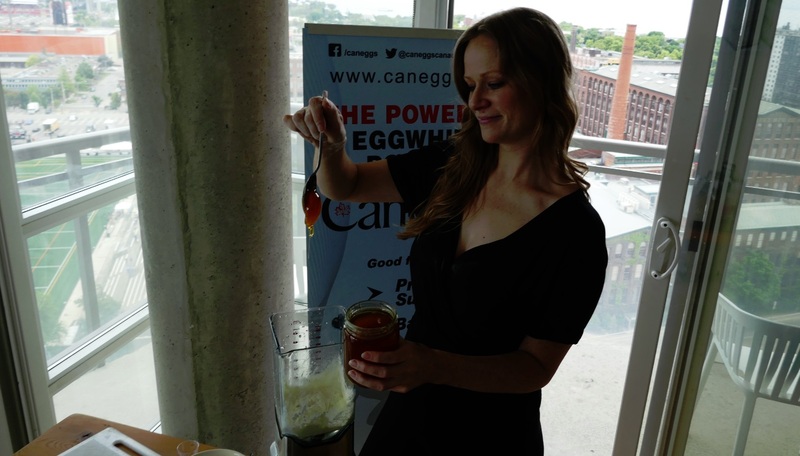 CanEggs brand powdered egg whites are pasteurized (and dehydrated) so that they are safer to use than separating fresh eggs. Using it as a ‘beauty mask’ helps replenish skin and can help reduce the appearance of fine lines and pores. In the photo below, you can see I’m applying tissue paper to the model’s face, but this is not necessary. We tried it both ways and found that simply painting the face with the creamy mixture was mask enough. I made a pretty big batch for us all and we had plenty of leftovers so I have scaled back the recipe for you. The mixture already had a pleasant smell, but we opted to scent our face masks with an essential oil from Elabloom. “Enchanted” contains petitgrain essential oil, cedarwood essential oil, lavender essential oil, eucalyptus essential oil and clove essential oil. Don’t put too much in! Start with just one drop. Kiwi delivers a strong dose of Vitamin C which contains potent antioxidant power and also protects the skin from age-causing free radicals. We also believe the natural fatty oils in the avocado could penetrate deep into the skin, helping to soften and hydrate dry and flaky patches. They can formulate egg powders to be exactly what we need/want, like enriched with essential fatty acids. A batch of powder has a way longer shelf life than a carton of eggs. The egg white powder beauty mask also helps teens battling acne. Egg whites have astringent properties that help shrink pores by tightening the skin. Apply this mix onto your whole face or large pore affected areas. Here are two models after the treatment (and with some make-up) enjoying the view from the balcony.